It all started when I spied my friend's ( Linda of Bubble and Sweet) cute cookies made by using her matryoshka doll (Russian nesting dolls) cookie cutter(s). Linda made a monster and a mummy from the cutter, among other characters. I particularly liked the monster and the mummy, and a thought immediately popped into my head to make a mummy (mommy) and her little monsters (children) with my full set of five nesting doll cutters. The cookies measure from 6.25-inches down to 2.25-inches. This was the first time I used my set of nesting doll cookie cutters, so I was happy to finally christen them with such fun, easy cookies. It was about time! Linda used fondant to decorate her cookies, but I chose to decorate with royal icing. Thanks for the inspiration, Linda! Roll out sugar cookie dough. Use cutters to cut out shapes, and place dough on baking sheets. Bake according to recipe instructions. Let cookies cool. Prepare royal icing and add food coloring. Using a #3 decorating tip, prepare a decorating bag and outline the cookies with the icing. Let dry for about 15-20 minutes and then fill the cookies with royal icing of "fill" consistency. Let dry completely. Add hand details with royal icing. Add eyes and decorative sprinkles with a dab of royal icing. Use a black food marker and add facial details. Apply white royal icing for teeth. For the mummy, I used a Wilton, #102 tip to apply the white strips(I added the eyes first). This MUM wishes you all a wonderful weekend! Your welcome and thanks for the mention:) I adore your mummy and her little monsters, what a bunch of cuties. omgosh sue, i love this! what a great use of those cutters!!! I love them! My favorite is the one who won't smile! :) Haha! There's always "one" in the group shot. So cute! Love the bright colors. Oh my gosh! I LOVE THESE!!! They are so darn cute! You are so dang talented! Love love love 'em!! They are the cutest monsters on the block and their sprinkle decorations and bubbly eyes put them over the top!! Fantastic job! Sue - you're amazing! Love how you made each one unique. Those are totally precious! What a fun idea! These are so cute and creative! Your ideas always make me smile!! Can't wait to see you next week at Cookie Con!!! So exciting!! 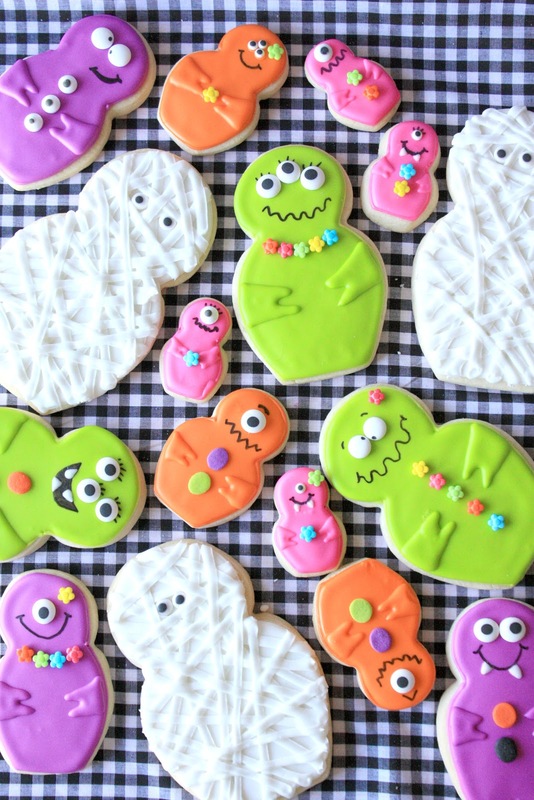 Love your monster family treats! I absolutely LOVE these!!!! Your details are always wonderful and these are just the cutest set of cookies ever. Seriously, I love it!! These are so adorable! they made me giggle!! I'm adoring everything about these!!!!!!! Now that's a family I could love!! I NEVER would have dreamed of using nesting dolls for Halloween!! BRILLIANT!! I love everything about these! Thanks for adding them to the Halloween Party!! Man...these are so stinkin cute! I love the faces and expressions of each one. So funny!!! These are so incredibly adorable and they are so perfectly decorated! These are darling! Almost too cute to eat! I LOVE them all! so creative, Sue! Wow...adorable!! I would LOVE for you to link this up at my Ginger Jamboree Link Party!! Absolutely adorable!!! I don't think I could eat one, they are just too cute! New favorite halloween cookies!!! the one that won't smile is my favorite....I just want to tickle him! These are SUPER CUTE and SUPER ADORABLE !! They are so fun. I love all the different designs and silly faces. Such a cute collection. Sharing these again this year Sue! I love them so so much! !